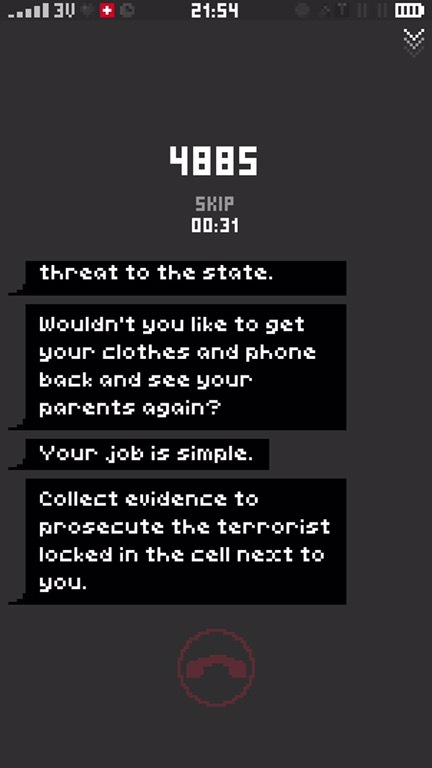 My experience with SOMI’s surveillance game, Replica, has been a bit of a rollercoaster ride. I was really looking forward to the game when I first heard about it and was disappointed when it turned out that mobile players would have to wait longer for it than PC players would. 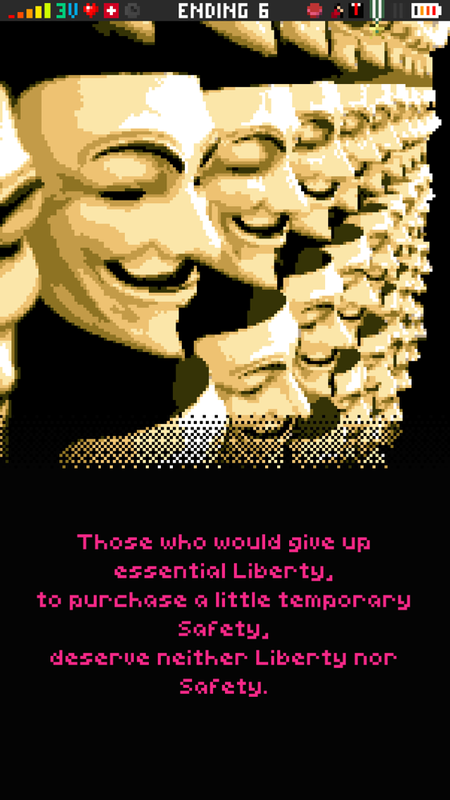 Then, when I finally got my hands on the game, it was right after the recent election and I just couldn’t bring myself to play any games, much less one about a dystopian future. But, a few days passed and I gave it a chance. My initial reaction was positive. Besides a compelling dystopian setting highlighting issues of surveillance, it was clear that this was a puzzle game at heart. The very first thing you’re tasked with is figuring out how to unlock this phone that’s in your hand. But it’s done naturally, without really telling you this. You’re staring at a locked screen, so of course you’re going to mess around and try and figure out how to get in. Once you get past that initial puzzle, you learn that this is someone else’s phone, not your own. You’re locked in a cell and have been instructed by Homeland Security to look through it and find any possible terrorist connections. You’re told that you must do this to prove that you yourself are not a terrorist. And then you’re left to dig around in his contacts, texts, photos, social network profiles, and more, to see what you can find. 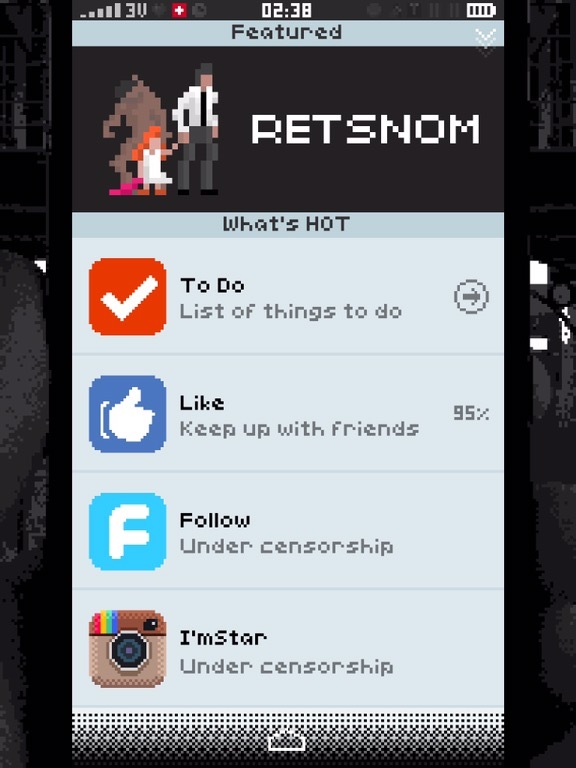 The entire game takes place inside this fictional smartphone. 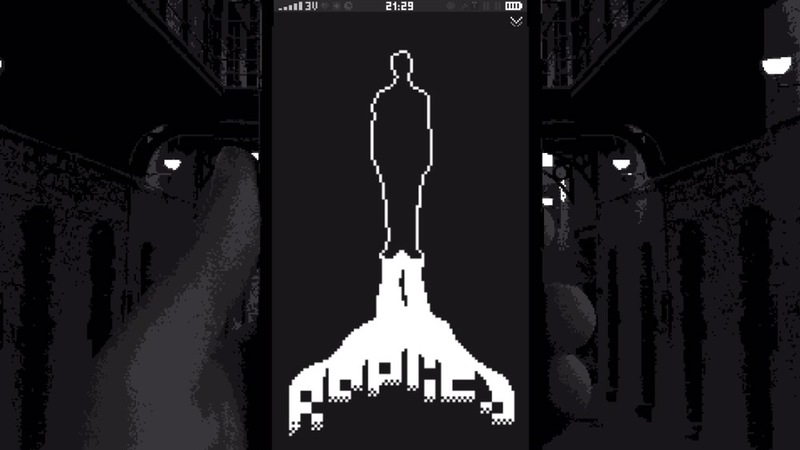 If you play on a phone, the game just mimics a smartphone. If you play on iPad, it’s the same but you have an image of a hand in the background to fill in the empty space. Both also work in either landscape or portrait mode. While I don’t see any good reason to play in landscape on an iPhone, the portrait iPad version turns it into a large-print version of the game. If you have a hard time staring at a small phone for long periods of time, this is a great solution. And, although the game uses pixel text and graphics and has a few things that would fit an Android phone more than an iPhone, most of it mimics an iPhone very believably. In fact, there were plenty of times I accidentally pressed my phone’s Home button instead of the one in the game. I always had to make that bit of conscious effort to press the in-game buttons and not accidentally leave the game. The text messaging, location settings, Bluetooth settings, and even the music app did a great job making me feel like I was really rummaging through someone else’s phone. There are even clones of well-known apps, such as Like, which is supposed to be Facebook, and Follow, which is meant to be Twitter. I was particularly impressed by the way the game moves you along with objectives using a To-Do list app that copies the popular Clear app. It’s never shy about its inspirations, and that made it feel simultaneously more authentic yet tongue-in-cheek at the same time. So, before getting deeper into why I would highly recommend Replica, let me explain more about that emotional roller coaster I went through with it. As I mentioned, I was enjoying it quite a bit right from the start. But, as with any good puzzle game, I got momentarily stuck after about half an hour. It was late and I was tired, so I figured I’d sleep on it and look through the phone again in the morning. But when I woke up and opened the game, it started me back at the beginning. I asked the developer and he told me the game does not save, but you can skip parts of it to get back to where you were. I was confused and this left a sour taste in my mouth. How can someone design a game that mimics a smartphone so closely and miss that vital aspect of mobile gaming? Surely he must realize that smartphones are not PCs and people need to be able to take breaks without losing their progress? I didn’t touch the game for at least another day because I dreaded starting it over every time I needed a break. But the developer insisted that the game was better this way and I finally caved. I sat down for about an hour and played through the main storyline. I basically did everything the game asked me to and found the most obvious ending. I enjoyed it, but I wasn’t sure I was sold enough to try and find more endings. One reason was that it felt a little too on-the-nose, lacking subtlety. Your contact at Homeland Security laughs about waterboarding in a way that makes it hard to take him seriously and be truly disturbed about going through someone else’s phone to brand them a terrorist. I mean, I know we just elected a cartoon villain to be our president, but I still prefer villains in fiction not to be. And yet, there was something that kept calling to me. New apps got added to the screen on my second play-through. I wasn’t sure yet what they’d do and I wanted to find out. But I kept resisting because I was worried once again about getting invested and then having to catch up again if I took a break. Then I finally gave in. It sucked me in to the point that it didn’t matter that I couldn’t take a lot of breaks, because I didn’t want to. And I started to understand why the game doesn’t save. I still wish there could have been a compromise somehow, but I see why the decision was made, and it makes sense. The skipping also helps, as well as the fact that the most straightforward ending is the longest one. So it’s easier to take breaks once you get through that ending. There were still some things that felt off and out of place, though. 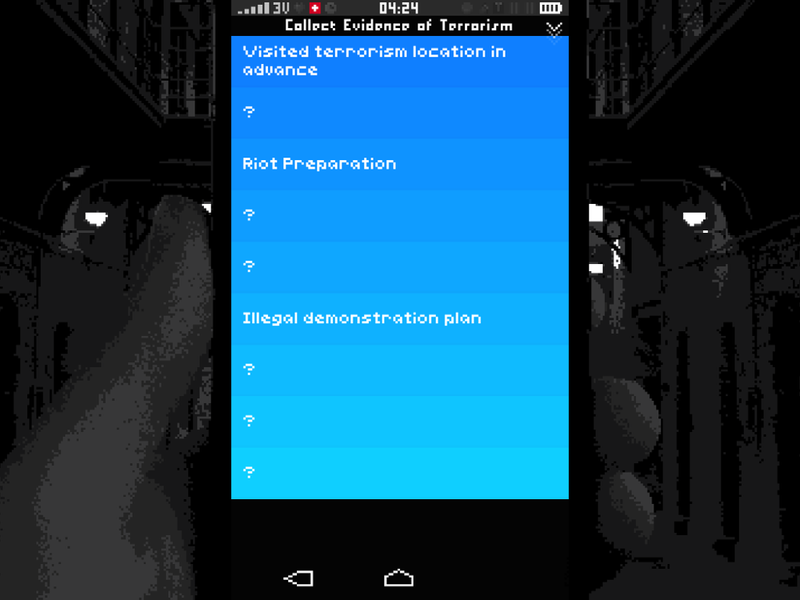 For instance, on the first play-through, you have to identify nine potential terrorist activities. But on your next play-through, identifying them isn’t enough. You have to also figure out which law it’s violating. It’s also not very clear at first, and I worried that my game was glitched. I’m not sure of the logic behind this. I like the idea of it, but why add that on the second time through? Why not include that initially and then allow players to skip that time-consuming aspect going forward? There are a couple of achievements and endings related to it, but I still think it could have been executed in a more player-friendly way. As is, it makes it more tedious to keep exploring and trying to find new endings, especially since you don’t know what’s a vital piece of information until you try to use it. Still, it’s a minor complaint in the big scheme of things and easily forgiven. Bottom line, I was sucked in and determined to uncover all this game’s secrets. So why did I tell you all this? I want to make sure that you don’t make the same mistake I did at first. If you get frustrated with Replica because it’s not obvious why things are the way they are, don’t get angry at it like I did. Just wait until you know you can devote your time and focus to it. It’s a game that demands your attention. If you only skim through texts or do exactly what the game asks of you, you’ll miss out on the best bits. While it wasn’t completely obvious at first, the more I played, the more I noticed the inspirations from games like Please, Don’t Touch Anything (PDTA) and Papers, Please — and I did notice it before the game made very clear references to them. I think the developer did a great job of turning that inspiration into his own unique game. While not everything about it works well or is a slam dunk, there’s a lot to like here. But for puzzle fans, the main attraction is the same type of hidden clues, achievements, and multiple endings that you’ll only be able to find by being very observant. And the endings and achievements do permanently affect the game, even if it doesn’t save other progress. While the setting and layout of the game works very well with this concept, it can be a bit overwhelming at times. There’s much more information to go through here than in the other games, and it takes some patience to keep going through the same apps, the same texts, looking for something you may have missed or just didn’t consider important. In fact, I’m a little bit annoyed that a few things I was sure would be part of some clue ended up having no significance. But perhaps a few red herrings isn’t such a bad thing. the surface. If you play through the most obvious ending and then quit, you’ll be robbing yourself of the best aspects of the game. Even if you have to cheat a little to find all the extra content, it’s worth doing so in order to experience it. Each ending you discover builds on the story and fleshes it out a bit more. And there’s so much to see. Replica can be little too cartoony and on-the-nose at times, and yet I’m not sure I can fault it for that. In the end, it works. It might have been more disturbing and effective as a warning against sacrificing privacy for safety had they gone with a more nuanced approach, but I’m ok with what it is. The absurdity allowed the developer to include some humorous endings that would have otherwise felt out of place. 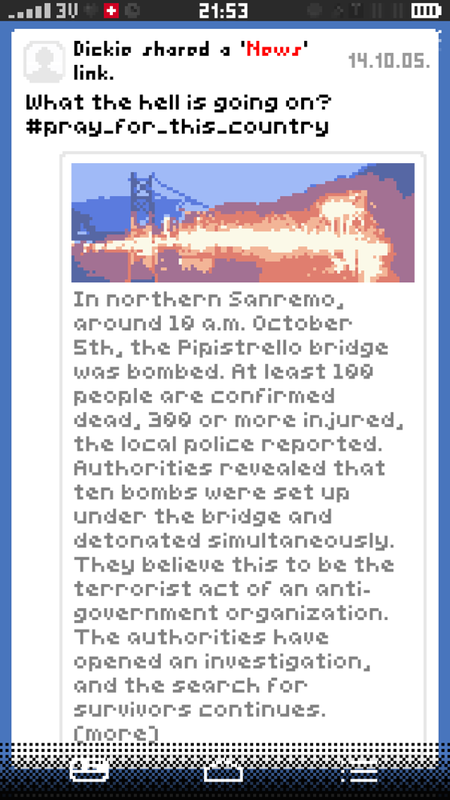 There have been a few games that tried to capture that Papers, Please and PDTA vibe in the last couple of years, and this is the first one that felt mostly satisfying to me. Games like The Westport Independent and KOMRAD had good ideas and multiple endings but they didn’t feel fully realized. Instead of getting richer with each discovered ending, they started to fall apart the more you replayed. I had the exact opposite experience with Replica. Each ending I uncovered made me want to delve right back in and discover more. While it might take a while — and top-notch observational skills — to see everything Replica has to offer, each new surprise makes it worth that effort. If you can look past its shortcomings and not make the same mistakes I did early on, you’ll have a great experience with it. If you’re willing to give it a chance, you can download it here. And if you’re stuck, make sure to try my Replica walkthrough guide.